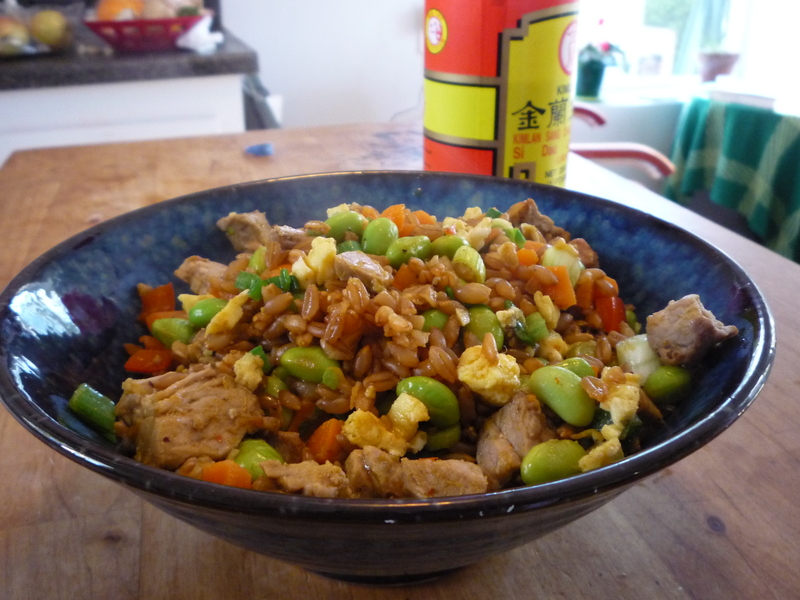 A little leftover pork and some leftover rice in the fridge, along with a few veggies, is always a good excuse to make pork fried rice. In fact, I often cook extra rice just for that purpose. 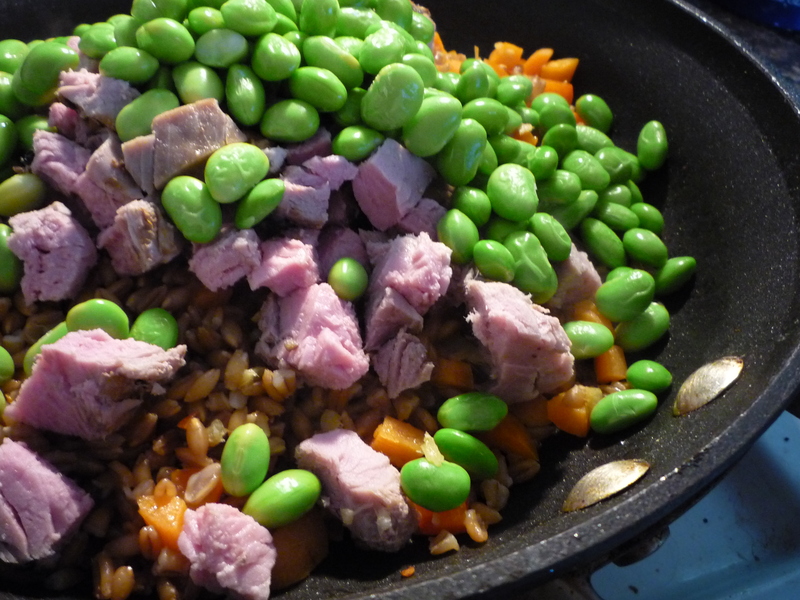 Last night, I found myself with the pork and the vegetables, but the leftover grain was farro. Farro is an old Italian grain that’s similar to wheat. However, farro cooks much more quickly than wheat berries. Just put them in a sauce pan with enough water to cover by about and inch and a half and simmer for about 15 minutes. Farro is a nice alternative to rice as a side dish and is great in soups and salads. I’ve even been known to eat cold leftover farro for breakfast with a little yogurt and some fresh berries. I think the word “toothsome” is a little overused as a food descriptor, but the term hits the mark with farro. It’s tender to the bite, but definitely holds its shape. It has a light nutty flavor with a hint of barley (but without that sliminess that comes with barley). 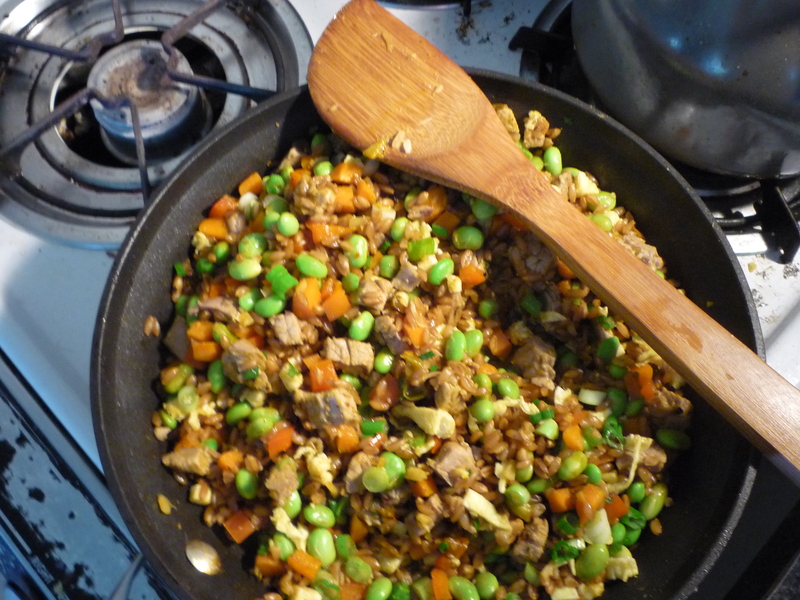 It’s texture and flavor make it a natural for a fried rice style preparation. Heat 2 teaspoons of the oil in a large non-stick sauté pan or wok over medium-high heat. Scramble egg with about a teaspoon of water. 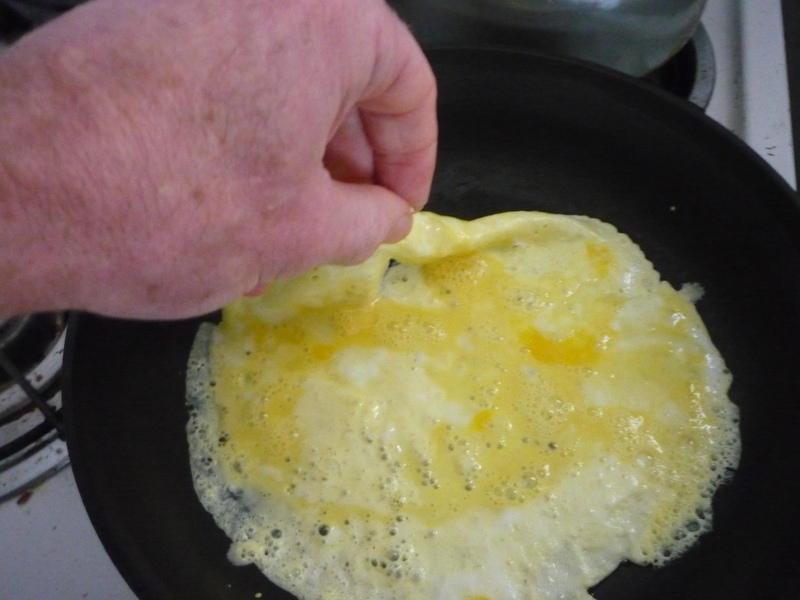 When oil shimmers, add egg to pan and swirl around the pan (crepe style) until bottom is covered. As soon as the “crepe” is set (about 15-20 seconds), loosen with a silicone spatula and flip over to cook other side for another 15-20 seconds. Roll out onto a cutting board and chop into small pieces. Wipe out pan with a paper towel. Meanwhile, bring a quart of water to a boil in a small sauce pan. Add a generous amount of salt and the frozen edamame beans. Return a boil, reduce heat to a simmer and cook for a couple of minutes. Drain, run under cold water and set aside. Heat remaining 2 teaspoons of oil over high heat in the pan or wok until simmering. Add ginger and garlic and swirl around pan until fragrant—about 30 seconds. Add pepper and carrot and cook for a minute or two, until just beginning to soften. Lower heat to medium and add farro. Stir around until farro is heated through—about 3 minutes. Add edamame, pork and soy sauce. If you’d like a little heat, add the sambal or an appropriate amount of your favorite hot condiment. Stir to combine. Add egg and green onions. Taste and add more soy or sambal if needed.